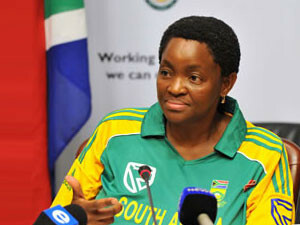 Social development minister Bathabile Dlamini assures social grant payments will continue on 1 April. With less than two months before the social grants contract comes to an end, there is no indication of how the SA Social Security Agency (SASSA) will ensure payment of 17 million beneficiaries. This week, SASSA was expected to file papers with the Constitutional Court (ConCourt) with proposals on the payment of social grants from 1 April; however, this has yet to happen. The agency said it planned to approach the ConCourt to ask for the current payments contract with Cash Paymaster Services (CPS) to be extended. This marks the third failed attempt by SASSA to submit its application to the highest court in the land to request an extension of the contract, after previously noting it was not ready to submit its report. Department of Social Development (DSD) spokesperson Lumka Oliphant could not confirm when SASSA or the department will file an application to have the contract extended. The department will issue a statement once it has filed its application with the ConCourt, she says. Earlier this month, SASSA told Parliament's social development portfolio committee it had come up short to find working solutions to pay social grants. South African social grants are currently administered and distributed by CPS, a subsidiary of US-based Net1 UEPS Technologies, after it was awarded a five-year, R10 billion tender in January 2012. The tender was declared invalid by the ConCourt in November 2013, and SASSA was instructed to initiate a new tender process. In 2015, SASSA issued a new tender contract but did not award the tender, opting to move the payment of social grants in-house. This week saw reports that finance minister Pravin Gordhan and social development minister Bathabile Dlamini were at war with each other over the social grants distribution saga. According to the reports, the finance minister does not want the reappointment of CPS as the service provider for the distribution of social grants come 1 April. The Star reported that on 1 February, Gordhan wrote to Dlamini, and stated a new contract should be awarded to commercial banks and the SA Post Office. The newspaper alluded to a looming showdown between the two ministers on the issue of social grant payments and extension of the tender with CPS. Both National Treasury and the DSD have refuted these claims, calling them malicious and intended to drive a wedge between the ministers. Treasury said the context and headline are misleading. "National Treasury is happy that the DSD has committed to seek the view of the Constitutional Court insofar as the option it prefers is concerned on which the court has previously made a determination." Meanwhile, the press today reported on a legal opinion obtained from advocate Wim Trengrove, which shows it would take SASSA "years rather than months" to take over the distribution of social grants. However, the department says these reports are also malicious and deliberate attempts to mislead South Africans. In a statement, social development says Trengrove was commissioned by the work-stream on legal and regulatory as appointed by the minister. His opinion was sought upon realising certain deliverables and time frames set to be achieved towards taking over the social grant payment function may not be achieved, says the statement. "The comprehensive opinion by Win Tengrove SC was part of the minister's attempt to make SASSA a better organisation. "It was one of three legal opinions sought, given the complex legal issues associated with a contract deemed invalid by the country's highest court." To read the complete SASSA statement, click here.